As direct descendants of the great courtier-poets Fujiwara no Shunzei (1114–1204) and his son Teika (1162–1244), the heirs of the noble Reizei house can claim an unbroken literary lineage that spans over eight hundred years. During all that time, their primary goal has been to sustain the poetic enterprise, or michi (way), of the house and to safeguard its literary assets. 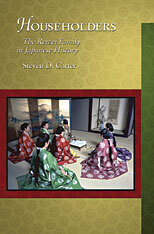 Steven D. Carter weaves together strands of family history, literary criticism, and historical research into a coherent narrative about the evolution of the Reizei Way. What emerges from this innovative approach is an elegant portrait of the Reizei poets as participants in a collective institution devoted more to the continuity of family poetic practices and ideals than to the concept of individual expression that is so central to more modern poetic culture. In addition to the narrative chapters, the book also features an extensive appendix of one hundred poems from over the centuries, by poets who were affiliated with the Reizei house. Carter’s annotations provide essential critical context for this selection of poems, and his deft translations underscore the rich contributions of the Reizei family and their many disciples to the Japanese poetic tradition.